Earlier this week Kim Dotcom resigned as Mega director to focus on other projects, including his upcoming music service. TorrentFreak can now confirm that the new service will be called Baboom. While the official release is still a few months away Dotcom was kind enough to share an early teaser with us. "Artists never had more freedom, transparency and control," he says. December 2011, a month before the criminal proceeding against Megaupload became public, Kim Dotcom first revealed his plans to launch a new service to transform the music business. At the time the project was called Megabox and the similarly named .com domain was seized by the U.S. Government. 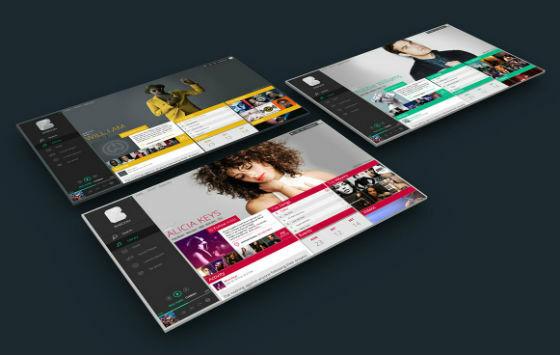 However, despite all the legal troubles, Dotcom continued development on the music platform. TorrentFreak presented the Internet entrepeneur with these findings, and Dotcom confirmed that the new service will indeed launch at Baboom.com. Dotcom has already secured several millions in funding for the project and there are currently 22 developers working on it. Unlike Mega, Baboom will be operated by a company owned by the Internet entrepreneur himself. With Baboom, Dotcom strongly believes that he can revolutionize the music industry and give artists full control over their music again. “I am really excited about Baboom. I can’t wait for artists to see what i have created for them. Their entire career can be managed on Baboom. Artists never had more freedom, transparency and control,” he tells TorrentFreak. The teaser below shows what Baboom will look like, although not all design elements are final yet. The completed project will be much more advanced than how the Megabox idea initially started, and Dotcom doesn’t plan to release it before it’s perfect. Dotcom previously said that there are several “top artists” lined up for the launch, but those featured in the teaser above are just internal design placeholders, for now. When it’s released Baboom will give the public access to free music, while compensating artists through advertising revenue. With this “free music” business model Dotcom believes he can decrease music piracy while giving artists proper compensation for their work. In addition, Baboom is expected to have a paid version where music fans can pay for music and not be bothered by ads. It is no secret that Dotcom has several prominent connections in the music industry and it will be interesting to see which artists join the project. In any case, there will definitely be plenty of attention for Baboom’s launch. Whether Baboom will be able to challenge the mighty influence of the major labels will become clear in a few months’ time.